A number of substantial changes are to be made to Council Regulation (EC) No 1777/2005 of 17 October 2005 laying down implementing measures for Directive 77/388/EEC on the common system of value added tax (2). It is desirable, for reasons of clarity and rationalisation, that the provisions in question should be recast. Directive 2006/112/EC contains rules on value added tax (VAT) which, in some cases, are subject to interpretation by the Member States. The adoption of common provisions implementing Directive 2006/112/EC should ensure that application of the VAT system complies more fully with the objective of the internal market, in cases where divergences in application have arisen or may arise which are incompatible with the proper functioning of such internal market. These implementing measures are legally binding only from the date of the entry into force of this Regulation and are without prejudice to the validity of the legislation and interpretation previously adopted by the Member States. Changes resulting from the adoption of Council Directive 2008/8/EC of 12 February 2008 amending Directive 2006/112/EC as regards the place of supply of services (3) should be reflected in this Regulation. The objective of this Regulation is to ensure uniform application of the current VAT system by laying down rules implementing Directive 2006/112/EC, in particular in respect of taxable persons, the supply of goods and services, and the place of taxable transactions. In accordance with the principle of proportionality as set out in Article 5(4) of the Treaty on European Union, this Regulation does not go beyond what is necessary in order to achieve this objective. Since it is binding and directly applicable in all Member States, uniformity of application will be best ensured by a Regulation. These implementing provisions contain specific rules in response to selective questions of application and are designed to bring uniform treatment throughout the Union to those specific circumstances only. They are therefore not conclusive for other cases and, in view of their formulation, are to be applied restrictively. If a non-taxable person changes residence and transfers a new means of transport, or a new means of transport returns to the Member State from which it was originally supplied exempt of VAT to the non-taxable person returning it, it should be clarified that such a transfer does not constitute the intra-Community acquisition of a new means of transport. For certain services, it is sufficient for the supplier to demonstrate that the customer for these services, whether or not a taxable person, is located outside the Community for the supply of those services to fall outside the scope of VAT. It should be specified that the allocation of a VAT identification number to a taxable person who makes or receives a supply of services to or from another Member State, and for which the VAT is payable solely by the customer, does not affect the right of that taxable person to benefit from non-taxation of his intra-Community acquisitions of goods. However, if the taxable person communicates his VAT identification number to the supplier in respect of an intra-Community acquisition of goods, he is in any event deemed to have opted to make those transactions subject to VAT. The further integration of the internal market has led to an increased need for cooperation by economic operators established in different Member States across internal borders and the development of European economic interest groupings (EEIGs), constituted in accordance with Council Regulation (EEC) No 2137/85 of 25 July 1985 on the European Economic Interest Grouping (EEIG) (4). It should therefore be clarified that EEIGs are taxable persons where they supply goods or services for consideration. It is necessary to clearly define restaurant and catering services, the distinction between the two, and the appropriate treatment of these services. In order to enhance clarity, the transactions identified as electronically supplied services should be listed without the lists being definitive or exhaustive. It is necessary, on the one hand, to establish that a transaction which consists solely of assembling the various parts of a machine provided by a customer must be considered as a supply of services, and, on the other hand, to establish the place of such supply when the service is supplied to a non-taxable person. The sale of an option as a financial instrument should be treated as a supply of services separate from the underlying transactions to which the option relates. To ensure the uniform application of rules relating to the place of taxable transactions, concepts such as the place where a taxable person has established his business, fixed establishment, permanent address and the place where a person usually resides should be clarified. While taking into account the case law of the Court of Justice, the use of criteria which are as clear and objective as possible should facilitate the practical application of these concepts. Rules should be established to ensure the uniform treatment of supplies of goods once a supplier has exceeded the distance selling threshold for supplies to another Member State. It should be clarified that the journey of the means of transport determines the section of a passenger transport operation effected within the Community, and not the journey of the passengers within it. In the case of intra-Community acquisition of goods, the right of the Member State of acquisition to tax the acquisition should remain unaffected by the VAT treatment of the transaction in the Member States of departure. The correct application of the rules governing the place of supply of services relies mainly on the status of the customer as a taxable or non-taxable person, and on the capacity in which he is acting. In order to determine the customer’s status as a taxable person, it is necessary to establish what the supplier should be required to obtain as evidence from his customer. It should be clarified that when services supplied to a taxable person are intended for private use, including use by the customer’s staff, that taxable person cannot be deemed to be acting in his capacity as a taxable person. Communication by the customer of his VAT identification number to the supplier is sufficient to establish that the customer is acting in his capacity as a taxable person, unless the supplier has information to the contrary. It should also be ensured that a single service acquired for the business but also used for private purposes is only taxed in one place. In order to determine the customer’s place of establishment precisely, the supplier of the service is required to verify the information provided by the customer. Without prejudice to the general rule on the place of supply of services to a taxable person, where services are supplied to a customer established in more than one place, there should be rules to help the supplier determine the customer’s fixed establishment to which the service is provided, taking account of the circumstances. If the supplier of the services is not able to determine that place, there should be rules to clarify the supplier’s obligations. Those rules should not interfere with or change the customer’s obligations. The time at which the supplier of the service must determine the status, the capacity and the location of the customer, whether a taxable person or not, should also be specified. Without prejudice to the general application of the principle with respect to abusive practices to the provisions of this Regulation, it is appropriate to draw specific attention to its application to certain provisions of this Regulation. Certain specific services such as the assignment of television broadcasting rights in respect of football matches, the translation of texts, services for claiming VAT refunds, and services as an intermediary to a non-taxable person involve cross-border scenarios or even the participation of economic operators established outside the Community. The place of supply of these services needs to be clearly determined in order to create greater legal certainty. It should be specified that services supplied by an intermediary acting in the name and on behalf of another person who takes part in the provision of accommodation in the hotel sector are not governed by the specific rule for the supply of services connected with immovable property. Where various services supplied in the framework of organising a funeral form part of a single service, the rule on the place of supply should also be determined. In order to ensure uniform treatment of supplies of cultural, artistic, sporting, scientific, educational, entertainment and similar services, admission to such events and ancillary services which are related to admission need to be defined. It is necessary to clarify the treatment of restaurant services and catering services supplied on board a means of transport when passenger transport is being carried out on the territory of several countries. Given that particular rules for the hiring of a means of transport depend on the duration of its possession or use, it is necessary not only to establish which vehicles should be considered means of transport, but also to clarify the treatment of such a supply where one successive contract follows another. It is also necessary to determine the place where a means of transport is actually put at the disposal of the customer. In certain specific circumstances a credit or debit card handling fee which is paid in connection with a transaction should not reduce the taxable amount for that transaction. It is necessary to clarify that the reduced rate may be applied to the hiring out of tents, caravans and mobile homes installed on camping sites and used as accommodation. Vocational training or retraining should include instruction relating directly to a trade or profession as well as any instruction aimed at acquiring or updating knowledge for vocational purposes, regardless of the duration of a course. Platinum nobles should be treated as being excluded from the exemptions for currency, bank notes and coins. It should be specified that the exemption of the supply of services relating to the importation of goods the value of which is included in the taxable amount of those goods should cover transport services carried out during a change of residence. Goods transported outside the Community by the purchaser thereof and used for the equipping, fuelling or provisioning of means of transport used for non-business purposes by persons other than natural persons, such as bodies governed by public law and associations, should be excluded from the exemption for export transactions. To guarantee uniform administrative practices for the calculation of the minimum value for exemption on exportation of goods carried in the personal luggage of travellers, the provisions on such calculations should be harmonised. It should be specified that the exemption for certain transactions treated as exports should also apply to services covered by the special scheme for electronically supplied services. A body to be set up under the legal framework for a European Research Infrastructure Consortium (ERIC) should only qualify as an international body for the purposes of exemption from VAT where it fulfils certain conditions. The features necessary for it to benefit from exemption should therefore be identified. Supplies of goods and services under diplomatic and consular arrangements, or to recognised international bodies, or to certain armed forces are exempt from VAT subject to certain limits and conditions. In order that a taxable person making such a supply from another Member State can establish that the conditions and limits for this exemption are met, an exemption certificate should be established. Electronic import documents should also be admitted to exercise the right to deduct, where they fulfil the same requirements as paper-based documents. Where a supplier of goods or services has a fixed establishment within the territory of the Member State where the tax is due, the circumstances under which that establishment should be liable for payment of VAT should be specified. It should be clarified that a taxable person who has established his business within the territory of the Member State where the tax is due must be deemed to be a taxable person established in that Member State for the purposes of liability for the tax, even when that place of business is not involved in the supply of goods or services. It should be clarified that every taxable person is required to communicate his VAT identification number, as soon as he has one, for certain taxable transactions in order to ensure fairer collection of the tax. Weights for investment gold which are definitely accepted by the bullion market should be named and a common date for establishing the value of gold coins be determined to ensure equal treatment of economic operators. The special scheme for taxable persons not established in the Community, supplying services electronically to non-taxable persons established or resident within the Community, is subject to certain conditions. Where those conditions are no longer fulfilled, the consequences thereof should, in particular, be made clear. This Regulation lays down measures for the implementation of certain provisions of Titles I to V, and VII to XII of Directive 2006/112/EC. the return of a new means of transport by a non-taxable person to the Member State from which it was initially supplied to him under the exemption provided for in point (a) of Article 138(2) of Directive 2006/112/EC. the services listed in Article 59 of Directive 2006/112/EC. A taxable person who is entitled to non-taxation of his intra-Community acquisitions of goods, in accordance with Article 3 of Directive 2006/112/EC, shall remain so where, pursuant to Article 214(1)(d) or (e) of that Directive, a VAT identification number has been attributed to that taxable person for the services received for which he is liable to pay VAT or for the services supplied by him within the territory of another Member State for which VAT is payable solely by the recipient. However, if that taxable person communicates this VAT identification number to a supplier in respect of an intra-Community acquisition of goods, he shall be deemed to have exercised the option provided for in Article 3(3) of that Directive. A European Economic Interest Grouping (EEIG) constituted in accordance with Regulation (EEC) No 2137/85 which supplies goods or services for consideration to its members or to third parties shall be a taxable person within the meaning of Article 9(1) of Directive 2006/112/EC. 1. Restaurant and catering services mean services consisting of the supply of prepared or unprepared food or beverages or both, for human consumption, accompanied by sufficient support services allowing for the immediate consumption thereof. The provision of food or beverages or both is only one component of the whole in which services shall predominate. Restaurant services are the supply of such services on the premises of the supplier, and catering services are the supply of such services off the premises of the supplier. 2. The supply of prepared or unprepared food or beverages or both, whether or not including transport but without any other support services, shall not be considered restaurant or catering services within the meaning of paragraph 1. 1. ‘Electronically supplied services’ as referred to in Directive 2006/112/EC shall include services which are delivered over the Internet or an electronic network and the nature of which renders their supply essentially automated and involving minimal human intervention, and impossible to ensure in the absence of information technology. the services listed in Annex I.
telephone services provided through the Internet. If a taxable person only assembles the various parts of a machine all of which were provided to him by his customer, that transaction shall be a supply of services within the meaning of Article 24(1) of Directive 2006/112/EC. The sale of an option, where such a sale is a transaction falling within the scope of point (f) of Article 135(1) of Directive 2006/112/EC, shall be a supply of services within the meaning of Article 24(1) of that Directive. That supply of services shall be distinct from the underlying transactions to which the services relate. 1. For the application of Articles 44 and 45 of Directive 2006/112/EC, the place where the business of a taxable person is established shall be the place where the functions of the business’s central administration are carried out. 2. In order to determine the place referred to in paragraph 1, account shall be taken of the place where essential decisions concerning the general management of the business are taken, the place where the registered office of the business is located and the place where management meets. Where these criteria do not allow the place of establishment of a business to be determined with certainty, the place where essential decisions concerning the general management of the business are taken shall take precedence. 3. The mere presence of a postal address may not be taken to be the place of establishment of a business of a taxable person. 1. For the application of Article 44 of Directive 2006/112/EC, a ‘fixed establishment’ shall be any establishment, other than the place of establishment of a business referred to in Article 10 of this Regulation, characterised by a sufficient degree of permanence and a suitable structure in terms of human and technical resources to enable it to receive and use the services supplied to it for its own needs. Article 192a of Directive 2006/112/EC. 3. The fact of having a VAT identification number shall not in itself be sufficient to consider that a taxable person has a fixed establishment. For the application of Directive 2006/112/EC, the ‘permanent address’ of a natural person, whether or not a taxable person, shall be the address entered in the population or similar register, or the address indicated by that person to the relevant tax authorities, unless there is evidence that this address does not reflect reality. The place where a natural person ‘usually resides’, whether or not a taxable person, as referred to in Directive 2006/112/EC shall be the place where that natural person usually lives as a result of personal and occupational ties. Where the occupational ties are in a country different from that of the personal ties, or where no occupational ties exist, the place of usual residence shall be determined by personal ties which show close links between the natural person and a place where he is living. the value of his supplies of goods did not exceed the threshold in the course of the preceding calendar year. supplies of goods within that Member State in the calendar year following the calendar year in which the event referred to in point (a) occurred. The section of a passenger transport operation effected within the Community referred to in Article 37 of Directive 2006/112/EC, shall be determined by the journey of the means of transport and not by the journey completed by each of the passengers. Where an intra-Community acquisition of goods within the meaning of Article 20 of Directive 2006/112/EC has taken place, the Member State in which the dispatch or transport ends shall exercise its power of taxation irrespective of the VAT treatment applied to the transaction in the Member State in which the dispatch or transport began. Any request by a supplier of goods for a correction in the VAT invoiced by him and reported by him to the Member State where the dispatch or transport of the goods began shall be treated by that Member State in accordance with its own domestic rules. 1. If the place of supply of services depends on whether the customer is a taxable or non-taxable person, the status of the customer shall be determined on the basis of Articles 9 to 13 and Article 43 of Directive 2006/112/EC. 2. A non-taxable legal person who is identified or required to be identified for VAT purposes under point (b) of Article 214(1) of Directive 2006/112/EC because his intra-Community acquisitions of goods are subject to VAT or because he has exercised the option of making those operations subject to VAT shall be a taxable person within the meaning of Article 43 of that Directive. where the customer has not yet received an individual VAT identification number, but informs the supplier that he has applied for it and the supplier obtains any other proof which demonstrates that the customer is a taxable person or a non-taxable legal person required to be identified for VAT purposes and carries out a reasonable level of verification of the accuracy of the information provided by the customer, by normal commercial security measures such as those relating to identity or payment checks. 2. Unless he has information to the contrary, the supplier may regard a customer established within the Community as a non-taxable person when he can demonstrate that the customer has not communicated his individual VAT identification number to him. where the customer does not possess that certificate, if the supplier has the VAT number, or a similar number attributed to the customer by the country of establishment and used to identify businesses or any other proof which demonstrates that the customer is a taxable person and if the supplier carries out a reasonable level of verification of the accuracy of the information provided by the customer, by normal commercial security measures such as those relating to identity or payment checks. For the purpose of applying the rules concerning the place of supply of services laid down in Articles 44 and 45 of Directive 2006/112/EC, a taxable person, or a non-taxable legal person deemed to be a taxable person, who receives services exclusively for private use, including use by his staff, shall be regarded as a non-taxable person. Unless he has information to the contrary, such as information on the nature of the services provided, the supplier may consider that the services are for the customer’s business use if, for that transaction, the customer has communicated his individual VAT identification number. Where one and the same service is intended for both private use, including use by the customer’s staff, and business use, the supply of that service shall be covered exclusively by Article 44 of Directive 2006/112/EC, provided there is no abusive practice. Where a supply of services carried out for a taxable person, or a non-taxable legal person deemed to be a taxable person, falls within the scope of Article 44 of Directive 2006/112/EC, and where that taxable person is established in a single country, or, in the absence of a place of establishment of a business or a fixed establishment, has his permanent address and usually resides in a single country, that supply of services shall be taxable in that country. The supplier shall establish that place based on information from the customer, and verify that information by normal commercial security measures such as those relating to identity or payment checks. The information may include the VAT identification number attributed by the Member State where the customer is established. Where a supply of services to a taxable person, or a non-taxable legal person deemed to be a taxable person, falls within the scope of Article 44 of Directive 2006/112/EC, and the taxable person is established in more than one country, that supply shall be taxable in the country where that taxable person has established his business. However, where the service is provided to a fixed establishment of the taxable person located in a place other than that where the customer has established his business, that supply shall be taxable at the place of the fixed establishment receiving that service and using it for its own needs. Where the taxable person does not have a place of establishment of a business or a fixed establishment, the supply shall be taxable at his permanent address or usual residence. 1. In order to identify the customer’s fixed establishment to which the service is provided, the supplier shall examine the nature and use of the service provided. Where the nature and use of the service provided do not enable him to identify the fixed establishment to which the service is provided, the supplier, in identifying that fixed establishment, shall pay particular attention to whether the contract, the order form and the VAT identification number attributed by the Member State of the customer and communicated to him by the customer identify the fixed establishment as the customer of the service and whether the fixed establishment is the entity paying for the service. Where the customer’s fixed establishment to which the service is provided cannot be determined in accordance with the first and second subparagraphs of this paragraph or where services covered by Article 44 of Directive 2006/112/EC are supplied to a taxable person under a contract covering one or more services used in an unidentifiable and non-quantifiable manner, the supplier may legitimately consider that the services have been supplied at the place where the customer has established his business. 2. The application of this Article shall be without prejudice to the customer’s obligations. 1. From 1 January 2013, where, in accordance with the first subparagraph of Article 56(2) of Directive 2006/112/EC, a supply of services is taxable at the place where the customer is established, or, in the absence of an establishment, where he has his permanent address or usually resides, the supplier shall establish that place based on factual information provided by the customer, and verify that information by normal commercial security measures such as those relating to identity or payment checks. 2. Where, in accordance with Articles 58 and 59 of Directive 2006/112/EC, a supply of services is taxable at the place where the customer is established, or, in the absence of an establishment, where he has his permanent address or usually resides, the supplier shall establish that place based on factual information provided by the customer, and verify that information by normal commercial security measures such as those relating to identity or payment checks. 1. From 1 January 2013, where services covered by the first subparagraph of Article 56(2) of Directive 2006/112/EC, are supplied to a non-taxable person who is established in more than one country or has his permanent address in one country and his usual residence in another, priority shall be given to the place that best ensures taxation at the place of actual consumption when determining the place of supply of those services. 2. Where services covered by Articles 58 and 59 of Directive 2006/112/EC are supplied to a non-taxable person who is established in more than one country or has his permanent address in one country and his usual residence in another, priority shall be given to the place that best ensures taxation at the place of actual consumption when determining the place of supply of those services. For the application of the rules governing the place of supply of services, only the circumstances existing at the time of the chargeable event shall be taken into account. Any subsequent changes to the use of the service received shall not affect the determination of the place of supply, provided there is no abusive practice. A transaction whereby a body assigns television broadcasting rights in respect of football matches to taxable persons, shall be covered by Article 44 of Directive 2006/112/EC. The supply of services which consist in applying for or receiving refunds of VAT under Council Directive 2008/9/EC of 12 February 2008 laying down detailed rules for the refund of value added tax, provided for in Directive 2006/112/EC, to taxable persons not established in the Member State of refund but established in another Member State (7) shall be covered by Article 44 of Directive 2006/112/EC. In so far as they constitute a single service, the supply of services made in the framework of organising a funeral shall fall within the scope of Articles 44 and 45 of Directive 2006/112/EC. Without prejudice to Article 41 of this Regulation, the supply of services of translation of texts shall fall within the scope of Articles 44 and 45 of Directive 2006/112/EC. The supply of services of intermediaries as referred to in Article 46 of Directive 2006/112/EC shall cover the services of intermediaries acting in the name and on behalf of the recipient of the service procured and the services performed by intermediaries acting in the name and on behalf of the provider of the services procured. Article 46 of that Directive, if supplied to a non-taxable person. 1. Services in respect of admission to cultural, artistic, sporting, scientific, educational, entertainment or similar events as referred to in Article 53 of Directive 2006/112/EC shall include the supply of services of which the essential characteristics are the granting of the right of admission to an event in exchange for a ticket or payment, including payment in the form of a subscription, a season ticket or a periodic fee. the right of admission to educational and scientific events such as conferences and seminars. 3. Paragraph 1 shall not cover the use of facilities such as gymnastics halls and suchlike, in exchange for the payment of a fee. The ancillary services referred to in Article 53 of Directive 2006/112/EC shall include services which are directly related to admission to cultural, artistic, sporting, scientific, educational, entertainment or similar events and which are supplied separately for a consideration to a person attending an event. Such ancillary services shall include in particular the use of cloakrooms or sanitary facilities but shall not include mere intermediary services relating to the sale of tickets. Except where the goods being assembled become part of immovable property, the place of the supply of services to a non-taxable person consisting only of the assembly by a taxable person of the various parts of a machine, all of which were provided to him by his customer, shall be established in accordance with Article 54 of Directive 2006/112/EC. The section of a passenger transport operation effected within the Community as referred to in Article 57 of Directive 2006/112/EC shall be determined by the journey of the means of transport and not by the journey completed by each of the passengers. Where restaurant services and catering services are supplied during the section of a passenger transport operation effected within the Community, that supply shall be covered by Article 57 of Directive 2006/112/EC. Where restaurant services and catering services are supplied outside such a section but on the territory of a Member State or a third country or third territory, that supply shall be covered by Article 55 of that Directive. The place of supply of a restaurant service or catering service carried out within the Community partly during a section of a passenger transport operation effected within the Community, and partly outside such a section but on the territory of a Member State, shall be determined in its entirety according to the rules for determining the place of supply applicable at the beginning of the supply of the restaurant or catering service. 1. ‘Means of transport’ as referred to in Article 56 and point (g) of the first paragraph of Article 59 of Directive 2006/112/EC shall include vehicles, whether motorised or not, and other equipment and devices designed to transport persons or objects from one place to another, which might be pulled, drawn or pushed by vehicles and which are normally designed to be used and actually capable of being used for transport. mechanically or electronically propelled invalid carriages. 3. Vehicles which are permanently immobilised and containers shall not be considered to be means of transport as referred to in paragraph 1. 1. For the application of Article 56 of Directive 2006/112/EC, the duration of the continuous possession or use of a means of transport which is the subject of hiring shall be determined on the basis of the contract between the parties involved. The contract shall serve as a presumption which may be rebutted by any means in fact or law in order to establish the actual duration of the continuous possession or use. The fact that the contractual period of short-term hiring within the meaning of Article 56 of Directive 2006/112/EC is exceeded on grounds of force majeure shall have no bearing on the determination of the duration of the continuous possession or use of the means of transport. 2. Where hiring of one and the same means of transport is covered by consecutive contracts between the same parties, the duration shall be that of the continuous possession or use of the means of transport provided for under the contracts as a whole. For the purposes of the first subparagraph a contract and its extensions shall be consecutive contracts. However, the duration of the short-term hire contract or contracts preceding a contract which is regarded as long-term shall not be called into question provided there is no abusive practice. 3. Unless there is abusive practice, consecutive contracts between the same parties for different means of transport shall not be considered to be consecutive contracts for the purposes of paragraph 2. The place where the means of transport is actually put at the disposal of the customer as referred to in Article 56(1) of Directive 2006/112/EC, shall be the place where the customer or a third party acting on his behalf takes physical possession of it. The supply of services of translation of texts to a non-taxable person established outside the Community shall be covered by point (c) of the first paragraph of Article 59 of Directive 2006/112/EC. Where a supplier of goods or services, as a condition of accepting payment by credit or debit card, requires the customer to pay an amount to himself or another undertaking, and where the total price payable by that customer is unaffected irrespective of how payment is accepted, that amount shall constitute an integral part of the taxable amount for the supply of the goods or services, under Articles 73 to 80 of Directive 2006/112/EC. ‘Provision of holiday accommodation’ as referred to in point (12) of Annex III to Directive 2006/112/EC shall include the hiring out of tents, caravans or mobile homes installed on camping sites and used as accommodation. Vocational training or retraining services provided under the conditions set out in point (i) of Article 132(1) of Directive 2006/112/EC shall include instruction relating directly to a trade or profession as well as any instruction aimed at acquiring or updating knowledge for vocational purposes. The duration of a vocational training or retraining course shall be irrelevant for this purpose. The exemption provided for in point (e) of Article 135(1) of Directive 2006/112/EC shall not apply to platinum nobles. The exemption provided for in Article 144 of Directive 2006/112/EC shall apply to transport services connected with the importation of movable property carried out as part of a change of residence. ‘Means of transport for private use’ as referred to in point (b) of Article 146(1) of Directive 2006/112/EC shall include means of transport used for non-business purposes by persons other than natural persons, such as bodies governed by public law within the meaning of Article 13 of that Directive and associations. In order to determine whether, as a condition for the exemption of the supply of goods carried in the personal luggage of travellers, the threshold set by a Member State in accordance with point (c) of the first subparagraph of Article 147(1) of Directive 2006/112/EC has been exceeded, the calculation shall be based on the invoice value. The aggregate value of several goods may be used only if all those goods are included on the same invoice issued by the same taxable person supplying goods to the same customer. The exemption provided for in Article 151 of Directive 2006/112/EC shall also apply to electronic services where these are provided by a taxable person to whom the special scheme for electronically supplied services provided for in Articles 357 to 369 of that Directive applies. it shall have specific and legitimate objectives that are jointly pursued and essentially non-economic in nature. 2. The exemption provided for in point (g) of Article 143(1) and point (b) of the first subparagraph of Article 151(1) of Directive 2006/112/EC shall apply to an ERIC referred to in paragraph 1 where it is recognised as an international body by the host Member State. The limits and conditions of such an exemption shall be laid down by agreement between the members of the ERIC in accordance with point (d) of Article 5(1) of Regulation (EC) No 723/2009. Where the goods are not dispatched or transported out of the Member State in which the supply takes place, and in the case of services, the exemption may be granted by means of a refund of the VAT in accordance with Article 151(2) of Directive 2006/112/EC. 1. Where the recipient of a supply of goods or services is established within the Community but not in the Member State in which the supply takes place, the VAT and/or excise duty exemption certificate set out in Annex II to this Regulation shall, subject to the explanatory notes set out in the Annex to that certificate, serve to confirm that the transaction qualifies for the exemption under Article 151 of Directive 2006/112/EC. When making use of that certificate, the Member State in which the recipient of the supply of goods or services is established may decide to use either a common VAT and excise duty exemption certificate or two separate certificates. 2. The certificate referred to in paragraph 1 shall be stamped by the competent authorities of the host Member State. However, if the goods or services are intended for official use, Member States may dispense the recipient from the requirement to have the certificate stamped under such conditions as they may lay down. This dispensation may be withdrawn in the case of abuse. Member States shall inform the Commission of the contact point designated to identify the services responsible for stamping the certificate and the extent to which they dispense with the requirement to have the certificate stamped. The Commission shall inform the other Member States of the information received from Member States. 3. Where direct exemption is applied in the Member State in which the supply takes place, the supplier shall obtain the certificate referred to in paragraph 1 of this Article from the recipient of the goods or services and retain it as part of his records. If the exemption is granted by means of a refund of the VAT, pursuant to Article 151(2) of Directive 2006/112/EC, the certificate shall be attached to the request for refund submitted to the Member State concerned. Where the Member State of importation has introduced an electronic system for completing customs formalities, the term ‘import document’ in point (e) of Article 178 of Directive 2006/112/EC shall cover electronic versions of such documents, provided that they allow for the exercise of the right of deduction to be checked. 1. For the application of Article 192a of Directive 2006/112/EC, a fixed establishment of the taxable person shall be taken into consideration only when it is characterised by a sufficient degree of permanence and a suitable structure in terms of human and technical resources to enable it to make the supply of goods or services in which it intervenes. 2. Where a taxable person has a fixed establishment within the territory of the Member State where the VAT is due, that establishment shall be considered as not intervening in the supply of goods or services within the meaning of point (b) of Article 192a of Directive 2006/112/EC, unless the technical and human resources of that fixed establishment are used by him for transactions inherent in the fulfilment of the taxable supply of those goods or services made within that Member State, before or during this fulfilment. Where the resources of the fixed establishment are only used for administrative support tasks such as accounting, invoicing and collection of debt-claims, they shall not be regarded as being used for the fulfilment of the supply of goods or services. However, if an invoice is issued under the VAT identification number attributed by the Member State of the fixed establishment, that fixed establishment shall be regarded as having intervened in the supply of goods or services made in that Member State unless there is proof to the contrary. Where a taxable person has established his place of business within the territory of the Member State where the VAT is due, Article 192a of Directive 2006/112/EC shall not apply whether or not that place of business intervenes in the supply of goods or services he makes within that Member State. For the transactions referred to in Article 262 of Directive 2006/112/EC, taxable persons to whom a VAT identification number has been attributed in accordance with Article 214 of that Directive and non-taxable legal persons identified for VAT purposes shall be required, when acting as such, to communicate their VAT identification number forthwith to those supplying goods and services to them. The taxable persons referred to in point (b) of Article 3(1) of Directive 2006/112/EC, who are entitled to non-taxation of their intra-Community acquisitions of goods in accordance with the first paragraph of Article 4 of this Regulation, shall not be required to communicate their VAT identification number to those supplying goods to them when a VAT identification number has been attributed to them in accordance with Article 214(1)(d) or (e) of that Directive. ‘Weights accepted by the bullion markets’ as referred to in point (l) of Article 344(1) of Directive 2006/112/EC shall at least cover the units and the weights traded as set out in Annex III to this Regulation. For the purposes of establishing the list of gold coins referred to in Article 345 of Directive 2006/112/EC, ‘price’ and ‘open market value’ as referred to in point (2) of Article 344(1) of that Directive shall be the price and open market value on 1 April of each year. If 1 April does not fall on a day on which those values are fixed, the values of the next day on which they are fixed shall be used. Where, in the course of a calendar quarter, a non-established taxable person using the special scheme for electronically supplied services provided for in Articles 357 to 369 of Directive 2006/112/EC meets at least one of the criteria for exclusion laid down in Article 363 of that Directive, the Member State of identification shall exclude that non-established taxable person from the special scheme. In such cases the non-established taxable person may subsequently be excluded from the special scheme at any time during that quarter. In respect of services supplied electronically prior to exclusion but during the calendar quarter in which exclusion occurs, the non-established taxable person shall submit a VAT return for the entire quarter in accordance with Article 364 of Directive 2006/112/EC. The requirement to submit this return shall have no effect on the requirement, if any, to be identified for VAT purposes in a Member State under the normal rules. Any return period (calendar quarter) within the meaning of Article 364 of Directive 2006/112/EC shall be a separate return period. Once a VAT return has been submitted as provided for under Article 364 of Directive 2006/112/EC, any subsequent changes to the figures contained therein may be made only by means of an amendment to that return and not by an adjustment to a subsequent return. Amounts on VAT returns made under the special scheme for electronically supplied services provided for in Articles 357 to 369 of Directive 2006/112/EC shall not be rounded up or down to the nearest whole monetary unit. The exact amount of VAT shall be reported and remitted. A Member State of identification which receives a payment in excess of that resulting from the VAT return submitted for electronically supplied services under Article 364 of Directive 2006/112/EC shall reimburse the overpaid amount directly to the taxable person concerned. Where the Member State of identification has received an amount pursuant to a VAT return subsequently found to be incorrect, and that Member State has already distributed that amount among the Member States of consumption, those Member States shall directly reimburse the overpayment to the non-established taxable person and inform the Member State of identification of the adjustment to be made. Amounts of VAT paid under Article 367 of Directive 2006/112/EC shall be specific to the VAT return submitted pursuant to Article 364 of that Directive. Any subsequent amendments to the amounts paid may be effected only by reference to that return and may not be allocated to another return, or adjusted on a subsequent return. Regulation (EC) No 1777/2005 is hereby repealed. References made to the repealed Regulation shall be construed as references to this Regulation and shall be read in accordance with the correlation table set out in Annex IV. It shall apply from 1 July 2011.
point (c) of Article 11(2) shall apply until 31 December 2014. Done at Brussels, 15 March 2011. (1) OJ L 347, 11.12.2006, p. 1. (2) OJ L 288, 29.10.2005, p. 1. (3) OJ L 44, 20.2.2008, p. 11. (4) OJ L 199, 31.7.1985, p. 1. (5) OJ L 268, 12.10.2010, p. 1. (6) OJ L 326, 21.11.1986, p. 40. (7) OJ L 44, 20.2.2008, p. 23. (8) OJ L 206, 8.8.2009, p. 1.
online supply of on-demand disc space. online automated installation of firewalls. use of search engines and Internet directories. accessing automated online games which are dependent on the Internet, or other similar electronic networks, where players are geographically remote from one another. workbooks completed by pupils online and marked automatically, without human intervention. For the supplier and/or the authorised warehousekeeper, this certificate serves as a supporting document for the tax exemption of the supplies of goods and services or the consignments of goods to the eligible bodies/individuals referred to in Article 151 of Directive 2006/112/EC and Article 13 of Directive 2008/118/EC. Accordingly, one certificate shall be drawn up for each supplier/warehousekeeper. Moreover, the supplier/warehousekeeper is required to keep this certificate as part of his records in accordance with the legal provisions applicable in his Member State. The general specification of the paper to be used is as laid down in the Official Journal of the European Communities C 164 of 1.7.1989, p. 3. The paper is to be white for all copies and should be 210 millimetres by 297 millimetres with а maximum tolerance of 5 millimetres less or 8 millimetres more with regard to their length. one copy to accompany the movement of the products subject to excise duty. Any unused space in box 5.B. is to be crossed out so that nothing can be added. The document must be completed legibly and in a manner that makes entries indelible. No erasures or overwriting are permitted. It shall be completed in a language recognised by the host Member State. 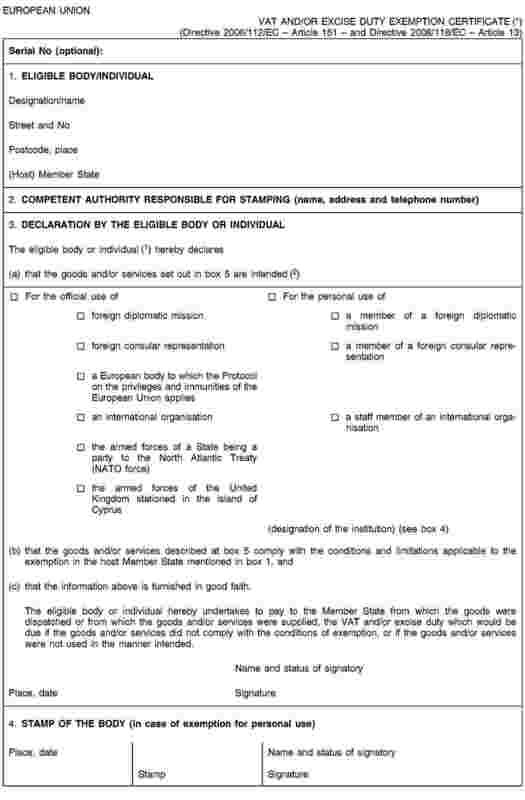 If the description of the goods and/or services (box 5.B of the certificate) refers to a purchase order form drawn up in a language other than a language recognised by the host Member Stale, a translation must be attached by the eligible body/individual. 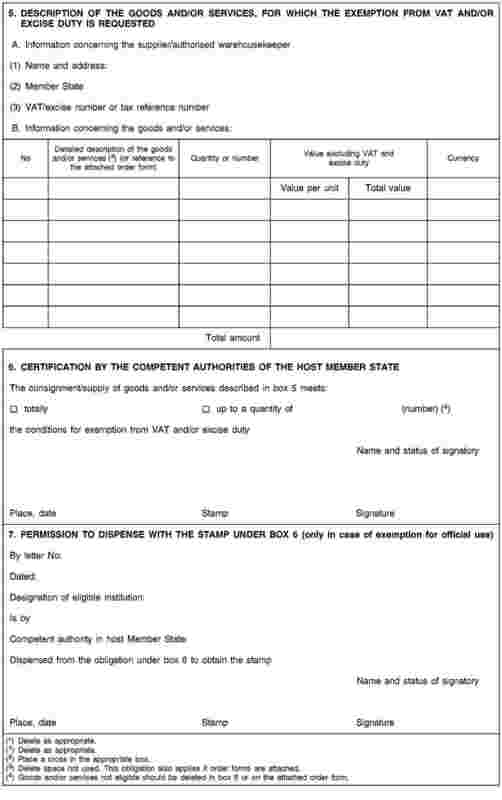 On the other hand, if the certificate is drawn up in a language other than a language recognised by the Member State of the supplier/warehousekeeper, a translation of the information concerning the goods and services in box 5.B must be attached by the eligible body/individual. A recognised language means one of the languages officially in use in the Member State or any other official language of the Union which the Member State declares can be used for this purpose. By its declaration in box 3 of the certificate, the eligible body/individual provides the information necessary for the evaluation of the request for exemption in the host Member State. By its declaration in box 4 of the certificate, the body confirms the details in boxes 1 and 3(a) of the document and certifies that the eligible individual is a staff member of the body. The reference to the purchase order form (box 5.B of the certificate) must contain at least the date and order number. The order form should contain all the elements that figure at box 5 of the certificate. If the certificate has to be stamped by the competent authority of the host Member State, the order form shall also be stamped. The indication of the excise identification number as defined in Article 22(2)(a) of Council Regulation (EC) No 2073/2004 of 16 November 2004 on administrative cooperation in the field of excise duties is optional; the VAT identification number or tax reference number must be indicated. The currencies should be indicated by means of a three-letter code in conformity with the ISO code 4217 standard established by the International Standards Organisation (1). The abovementioned declaration by the eligible body/individual; shall be authenticated at box 6 by the stamp of the competent authority of the host Member State. That authority can make its approval dependent on the agreement of another authority in its Member State. It is up to the competent tax authority to obtain such an agreement. To simplify the procedure, the competent authority can dispense with the obligation on the eligible body to ask for the stamp in the case of exemption for official use. The eligible body should mention this dispensation at box 7 of the certificate. (1) As an indication, some codes relating to currencies currently used: EUR (euro), BGN (lev), CZK (Czech koruna), DKK (Danish krone), GBP (pound sterling), HUF (forint), LTL (litas), PLN (zloty), RON (Romanian leu), SEK (Swedish krona), USD (United States dollar). (1) Tael = a traditional Chinese unit of weight. The nominal fineness of a Hong Kong tael bar is 990 but in Taiwan 5 and 10 tael bars can be 999,9 fineness. (2) Tola = a traditional Indian unit of weight for gold. The most popular sized bar is 10 tola, 999 fineness.